The man behind Union Square Hospitality Group will soon be taking the decision to tip (and how much to tip) out of your hands. A debate about tipping in restaurants has been raging for years. Many high-profile chefs argue that restaurants should do away with tipping entirely, and instead pay all workers—including servers and bartenders—a “living wage.” Others suggest that abolishing tipping will mean worse service; meanwhile, patrons will be paying 15 to 20 percent more for their meal. Danny Meyer, the man behind the Shake Shack empire and Union Square Hospitality Group, will soon be taking the decision of how much to tip out of your hands. Eater editor Ryan Sutton just broke the news that Meyer plans to completely eliminate tipping at every one of his 13 full-service restaurants in NYC by the end of 2016 (starting with The Modern). Many prices on the menu will be higher than they had been previously. Menus will display a note cluing diners in on the new policy. There will be no space on the check for leaving a tip. 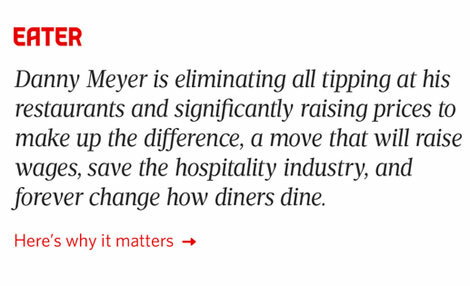 Many people in the restaurant industry agree that this is a revolutionary move by Meyer. Although, some argue that until more restaurants adopt the model, there will be no significant change in the system. But it only takes one person to start a revolution, right? And a lot of folks on Twitter are stoked about USHG abolishing tipping. But the real question is: How do servers and kitchen staff feel about this change?